On this day, all curricular areas concentrate on using the themes of Peace and Tolerance in the daily lessons. There are many ways to integrate the theme of belonging and kindness and unity and our teachers are focused on creating a culture of peace in our school and in our community. 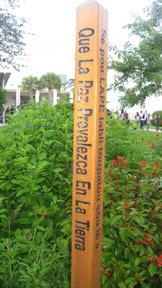 Our peace pole is the centerpiece of our campus - reminding our students that peace is the same in all languages! This day, too, we prepare our campus for the International Day of Peace celebration! We hang banners, put up peace doves, and gather everything we need for our Pinwheels for Peace event!